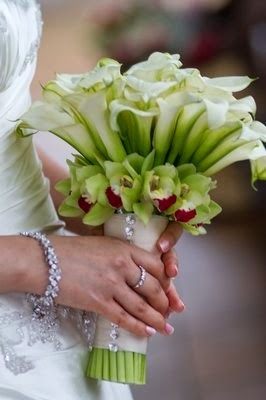 Memorable Wedding: Wedding Bouquets With Calla Lilies: Are You Sophisticated and Elegant Enough for These Beauties? 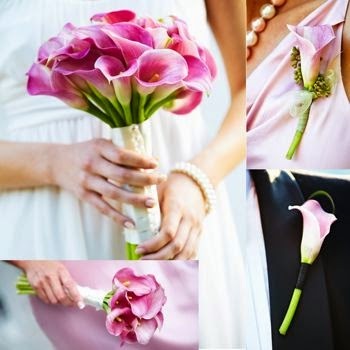 Wedding Bouquets With Calla Lilies: Are You Sophisticated and Elegant Enough for These Beauties? Are you considering choosing calla lilies as your main bridal flower for your wedding bouquets, boutonnieres, corsages and centerpieces? If so, you must be commended for your sophisticated taste and sense of style. The calla bouquet has a unique modern and chic style all on its own. 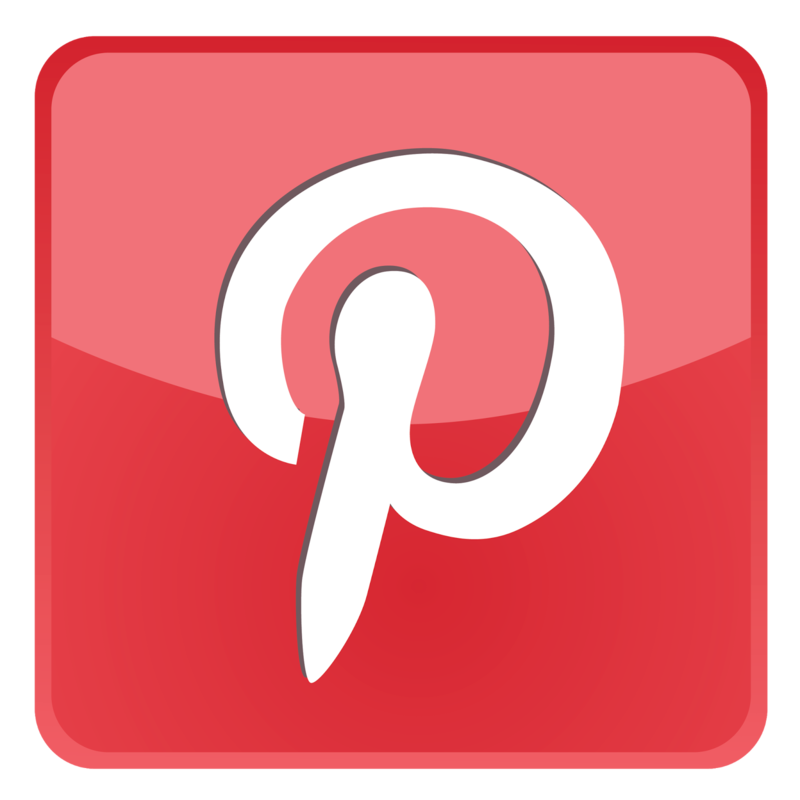 The word calla actually comes from the Greek word Kalla which means beauty. In the language of flowers, the calla lily means magnificent beauty, purity of thought and heavenly bliss...all good luck qualities that you would be wise to attract to your wedding day. Calla lilies, as you've probably guessed by their uniqueness, are on the expensive side in most parts of the world. However, the good news if you like this style, is that it doesn't take many flowers to make an outstanding impact. Another idea to save while still displaying the beauty and splendor of the calla is to pair them with roses. A bridal bouquet composed of pink roses and large ivory callas for example makes a dramatic statement. 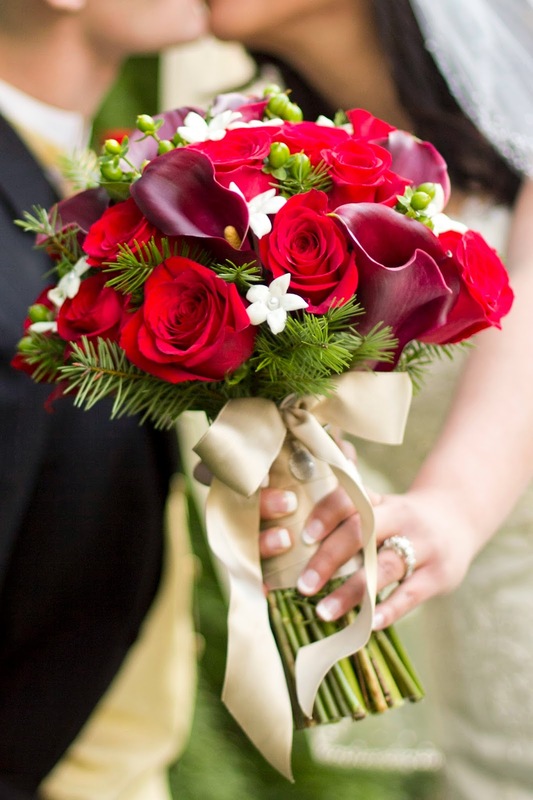 Simple, elegant and distinguished, callas are available year round. To keep them fresh, they will have to be stored in water between the times you are holding them. You could have vases of water at your reception hall to place them in when you get there. The beauty and grace of the calla lily is surely worth this extra precaution. Calla lilies come in many colors although the white (more like ivory or off white) is the most popular variety for weddings for obvious reasons. 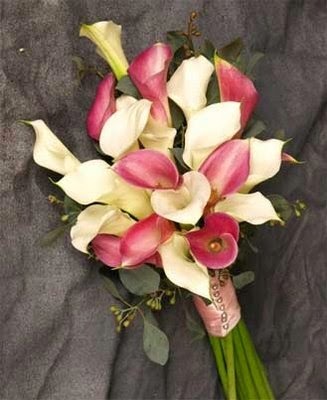 You will have a choice of large and small callas to create your dream wedding bouquets. You could choose to go with smaller callas if you prefer a delicate classic look and if you wish any amount over 6, however, don't do it to save money. Most often you will pay the same price for large and small callas but, it's worth asking about, if they are your preference. 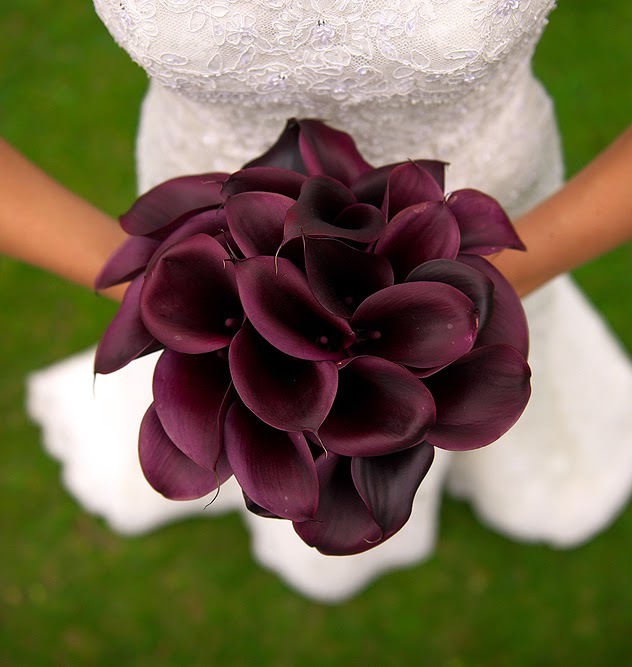 How many callas should you include in your bouquet? 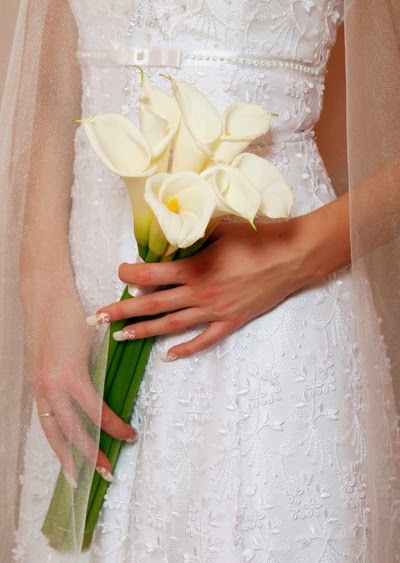 For your attendants, you could go with either 1, 2 or 3 large callas or 3 to 6 small callas hand-tied for each of your bridesmaids. 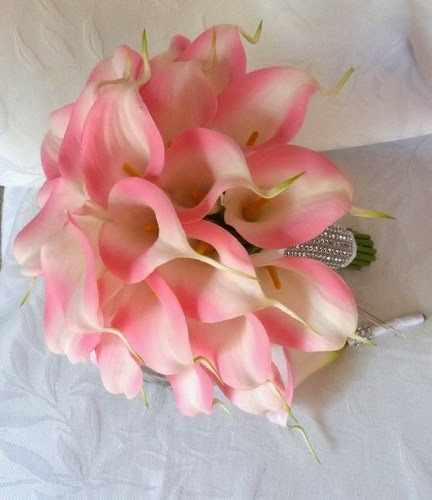 For the bride, you would want to go with uneven numbers for example 3 to 5 large calla lilies. Twelve to fifteen small callas look luxurious and purely elegant, whereas that many large callas will look ridiculously huge and out of place. 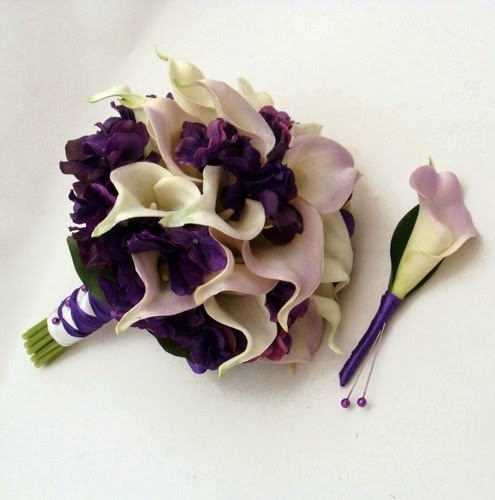 For corsages, even the small callas are on the large side although they do make stylish boutonnieres and corsages.